The National Meeting with between 10 and 20 representatives for each chapter. At this event the Movement’s ethical and political positions are defined. The Enlarged Coordination Committee counts two representatives for each chapter plus the Coordination Committee’s organizations. This Committee meets once a year in order to draw up a balance sheet and reflect upon the future actions of the Movement for the next five years. The approach adopted is a deliberative one, concrete tasks are assigned for the following year and it is then up to the Technical team to implement these actions. 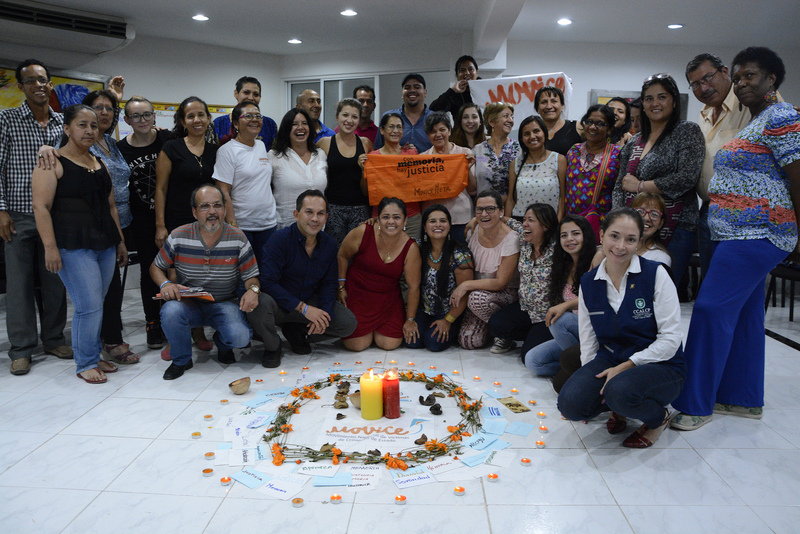 The Coordination Committee is located in Bogotá, representatives of 15 organizations take part in it, most of whom come from different regions of the country. In this Committee monthly decisions are made in order to implement the MOVICE’s political stance. They also decide on concrete actions to combat impunity. Decisions are voted by consensus between all the organizations that form part of this Committee. The Enlarged Coordination Committee evaluates whether it is necessary to initiate a national consultation to make the decision. The National Secretary sends a circular explaining the situation and exhorting the chapters representatives to meet and discuss in order for them to send their position in a memorandum. The Regional chapters meet and inform the National Secretary of their position. The National Coordination Committee meets up and takes the Regional Chapters´ stances into consideration in order to make a decision based on consensus. If the debate can not be sent by letter or by e-mail and that its implications are fundamental for the MOVICE, an extraordinary national meeting will take place to define the Movement position by consensus, exceptionally the use of vote is possible so as to come to a decision. An Operating Committee. In this Committee, there are organizations that manage the Movement’s economic resources and other organizations designated by the Coordination Committee that carry out a follow-up on the implementation of the projects budget. This Committee is in charge of making budgetary decisions for the MOVICE and is the body that manages the National Technical Team. Comité Permanente por la Defensa de los Derechos Humanos (CPDH) – Permanent Committee for the Defense of Human Rights. A Spokespersons Committee composed of delegate(s) of the strategies against impunity. Among their functions in the MOVICE they have the responsibility to represent the Movement before State institutions, platforms of institutional organizations, social organizations, the international community and the media. Thirteen Regional Monitoring Committees. They are meetings of the chapters where the regional work plans, the regional representation of the MOVICE, the organizational, training and political needs are discussed. Thirteen Regional Technical Secretaries. Elected by the Regional Monitoring Committees, they are responsible for the communication between the Technical National Secretary and the regional chapters. They are also responsible for the political and administrative execution of the activities in accordance with the annual work plan.